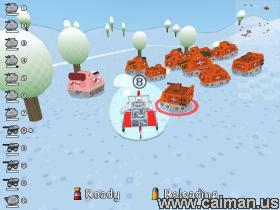 Caiman free games: Sunday Panzers by Bertone Ermes - Ermesdesign. 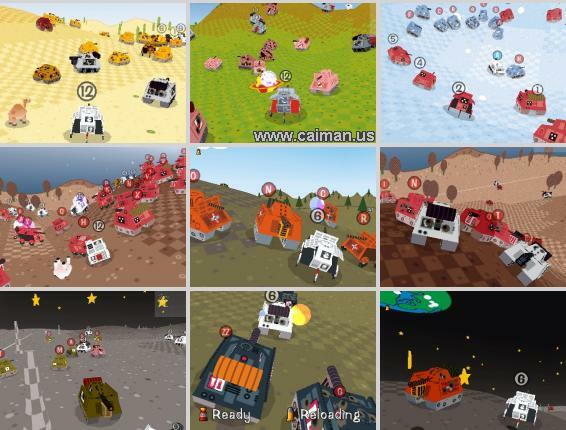 In this funny and chaotic battle game, you have to assemble a squad and beat the enemy. There are 8 different tanks and 10 kind of squads. You can create a squad of maximum 12 tanks. The enemy can have a maximum of 28 tanks and 5 guest tanks! 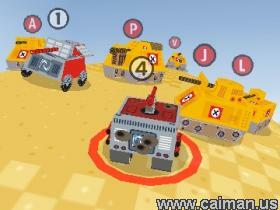 You control one of your tanks in a third person shooter mode, and the computer will control the others. By selecting your tanks, you can give them a stronger skill level. The most amazing thing of this game is the high quality of the AI (the computer controller). The AI is so good that you will get the feeling that you are playing against a human opponent. The game has 6 different worlds: meadow, snow area, desert, ... and even a moon landscape! Each world has his own animals. Very funny cows, camels, ... and even green aliens. If you are a sadist, you may shoot them too ;) But don't forget this game is kid safe and not violent. The cows will explode, no blood, just the cows will lay on their back, with their hoofd in the air. The effects you get when you touch a tree, cactus, or whatever, is also very funny. The trees will bend over and wobble back and forth for a while. It is real comical! The game has 50 levels. The first 10 levels are unlocked from the start, because they are training levels. Each time you win the last unlocked level the next level will be unlocked also. The game automatically saves the number of levels and squads, so you never have to worry about this. To unlock the last squad, a squad with enormously good properties, you have to finish all the levels succesfully. After that you can replay all the levels again, but this time by using your super squad! This is such a wonderful game, that I replayed the 50 levels again. I didn't describe the controls, because the game also contains a very nice manual. I just want to say here that you can choose between using a joystick or keyboard (arrows+space bar), and that the controls are very easy! The beautiful menu's are mouse controlled. The armour of the tanks is stronger on their front but weaker on their back... so shoot the tanks in their back! In the last level, the 50th one, I couldn't beat the enemy with my 12 super strong tanks! So, a bit of strategy was necessary. I took 11 very strong tanks, all with maximum skill and I controlled a weaker faster tank. I played very conservativly. I never stopped the tank and only fought when I got a shield (a powerup). In this manner I defeated 6 very strong enemy tanks, won the level and the game. This game is made with DarkBasic Pro 3.1 and the source code and other files are included in the download! Some people asked me which free game I like the most. Well, I think this could be the one . The funny and cartoonish graphics are great, the gameplay is excellent and the music and sound effects are good.